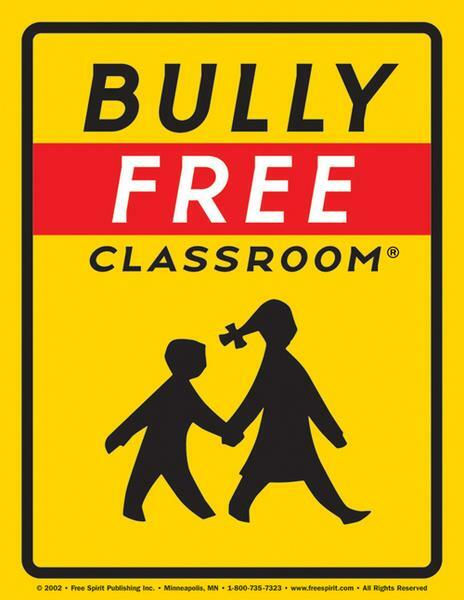 In the news, blogland and social media, there's been much discussion about bullying, in school or otherwise. Today I was reading through Teaching Tolerance's Facebook page and they asked teachers if they thought "today's bullying tactics are "hard for some adults to spot", as claims in this USA Today article suggest. Teachers responded, and what I was most struck by was the very lack of tolerance (or even kindness and respect, let alone understanding) on that particular fb page. Comments about how kids are crueler, nastier and more physically aggressive, and sneaky. Or there was this gem, Try observing a group of teenagers (unsupervised by any adults/parents) in a shopping mall! The language and attire are unacceptable! But of course, this is always someone else's child, right? And tellingly, With all the emphasis on NCLB and tests, there is little to no time for character education. This is not an excuse, just an explanation. The rest of the comments reflected much the same sentiments, that teachers alone can not prevent bullying, that parents are equally responsible and that so much bullying doesn't happen on school grounds, so why blame school? I have seen far too much bullying and controlling behavior among adults in the workplace directed at other adults to think that children have much of a chance until society as a whole takes a stand against abuse in all its forms, and against controlling and manipulative behavior that does others emotional harm. Few adults admit that they are bullies (they rather call themselves "tough" or "assertive" or "good leaders") and that is part of the problem - denial is too easy. •Less play time in kindergarten and pre-school. In the past, children spent much of their time in programs playing with, and learning to get along with, other children. Now they spend much more time on academics and tests. •More electronic communication. If you can ask someone out and break up with them via text or instant messaging, you don't have to develop the social skills necessary for face-to-face encounters. This produces socially maladroit kids who are fodder for bullies. •TV and movies with the wrong message. A study by one of Englander's graduate students found that kids' entertainment programs so full of situations in which teenage meanness is rewarded that the project's parameters had to be adjusted. •Parental ignorance. This takes two forms: obliviousness to what their kids do online — in a survey of Bridgewater State students, half said their parents never supervised their online activity in high school — and a denial about bullying. Wow. That's it? That's all they've got? There seems to be a disconnect between understanding what bullying is and why it occurs. And given many of the responses on the Teaching Tolerance question, I see why. No one is addressing the issue of control and who has it and who lacks it. 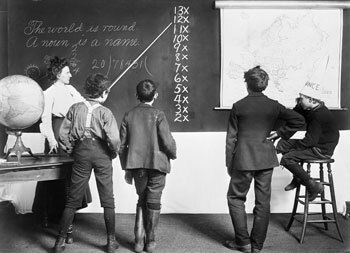 So here we have a system of compulsory education, based on the factory model, where both parents and children are stripped of civil liberties the moment their child enters school or even school property, we insist that children are separated from their families by age five and increasingly this begins earlier and earlier once pre-school is factored in. 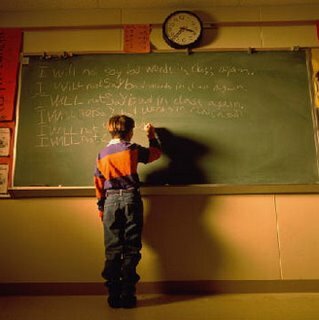 Children are forced to associate with one age group and a few authoritarian adults in a system they have little to no control over and in which their autonomy has been stripped, they are graded, reprimanded, tracked, told what to learn and how to learn it and if they don't comply, they are labeled problem students. In this adultcentrist culture, children's time is not their own, decisions about the function of school are made without them, they are told what to wear, what books to read, what they can say and even think. And yet, we are surprised at the predominance of bullying in young people (as if it is exclusive to them) and we point fingers at one another, failing to see that the system of education, within our adherence to our own factory model 9 to 5 life, is the catalyst for bullying. No longer is there interdependence among children and adults, there's just dependants and authorities. 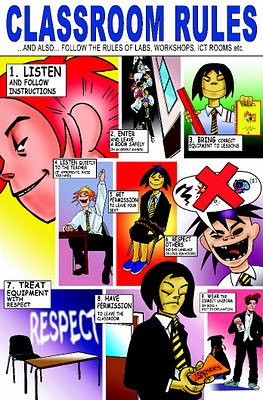 Bullying is about asserting control when a person feels a lack of control. And since school reinforces this lack of control, we have bullying, from children and adults alike. Even the classroom art speaks to the control, the sheer adultcentrism (even kyriarchy) that holds power over young people. Note the ropes to illustrate staying in one's seat. Nice. Good examples of power over bodies and minds, commonplace in the classroom. And this, the child appearing rather dragged along (force) by an adult (adultcentrism) to illustrate, ironically, an anti-bullying message. Yes, bullying needs to be addressed, absolutely. But let's start where it takes hold and festers before we point fingers inappropriately or put blame where it doesn't belong. Let's shine a bright light on cultural constructs that set children up for seeking control over their lives when they feel they have none. 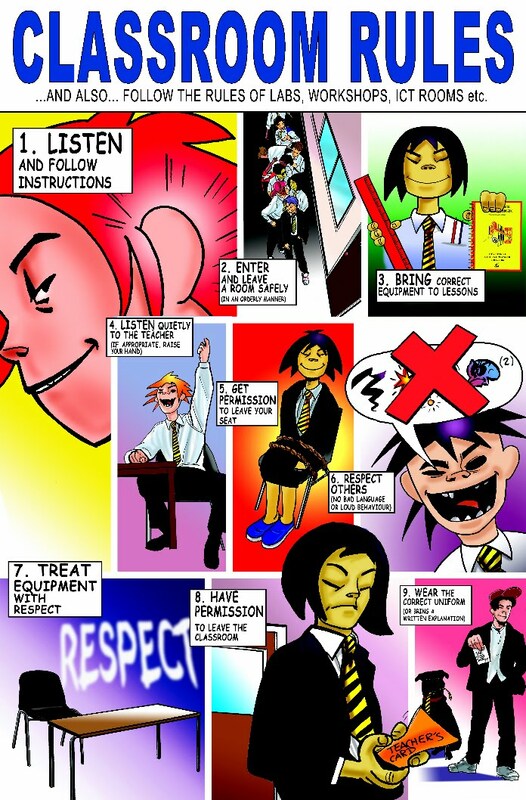 And finally, let's have honest discussions about our adult roles in bullying. 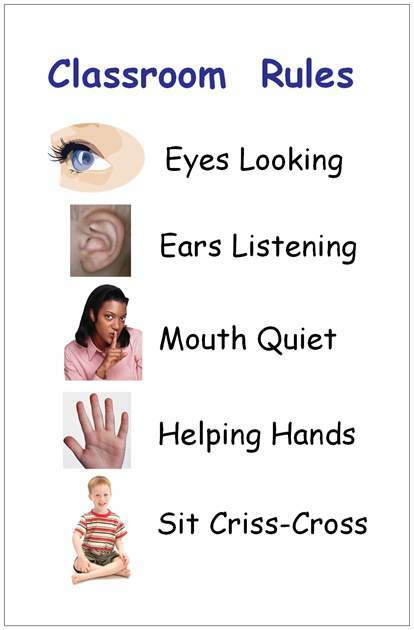 Let's think hard about the language we are using and signals we are sending our children, and let's take responsibility for it. I haven't seen school posters in a very long time, but those posters were SHOCKING to say the least. Good post. I've been researching bullying a little bit for a possible future post, but end up in tears every time. *sigh* It's awful. having a child in school at this time, it is just a reminder of how awful school is. she went from really loving learning to working for the grade. 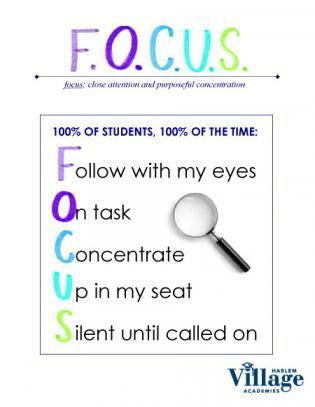 you have children constantly trying to "one up" each other, teachers who are burnt out and no longer have patients. they demean children by demanding that they ask to use the bathroom, to get a drink. they are forced to eat food quickly and if they eat a school lunch it is usually unhealthy trash. they are not given time to really grasp a subject, really engage. if they really are inspired by a book, a project, whatever... it is too bad, time to move on. i think the things you listed from the end of the article are right on target, especially the one about electronic communication. people will say things on-line that they never would say in person. facebook, text messaging, it depersonalizes emotions, and people. it is easy to brush people off when you don't have to see them, it is easy to be hurtful if you never have to actually look someone in the eye. heck take a look at youtube comments. sheesh. i think as a society we focus on Independence too soon. we force babies to live with out human contact, demanding that they sleep alone, pushing pushing always to have children younger and younger to be away from family. then just when they should be experiencing some autonomy we shove them in schools and demand obedience. and forcing them into confined places with people who do not love them demanding things from them. and if they have any "issues" well too bad. honestly it is no wonder there are bullies. and although i know not everyone can or wants to homeschool their children, there are a heck of a lot of other ways to educate children that do not have to be like the way our public school system works things. We've been having a long discussion on my site (SecularHomeschool.com) about bullying...I added your post today as food for thought!! Thanks!! I know this is an old post but I am reading through your archives in order to "catch up". I love what you say here and couldn't agree more. I don't home/un-school as I am a single mom and cannot be home with my girls but I am no fan of the "factory model" which is public school. Thank you, as well, for broadening my horizons with terms like "kyriarchy" (which I'd never heard before and probably just misspelled.) I wish more people could/would take the time to seriously THINK and QUESTION. It seems parents are very stretched these days and lives are so busy that overwhelm and apathy rule the day. Anyway, I appreciate your POV, which is why I am reading through your blog. Cheers to you and your lovely family.